Iran unveiled its latest Wunderwaffe, the "FOTROS" long range UAV this week (1). 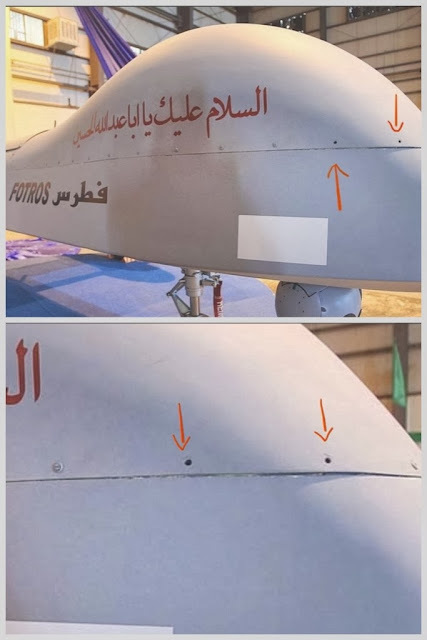 I'm sure I'm not the only noticing, but this high tech UAV seems to be missing two screws as shown in the above photos. I assume they are not there by design, or to house two tiny hidden cameras. One would think that as they put this toy together, they would have had a mechanism for quality control. Even though this media project was probably rushed ahead of this week's nuclear talks in Geneva, there is no excuse for this level of incompetence, and for making Iran the laughingstock of the world. As to the general effectiveness of Iranian UAVs, the proof, as they say, is in the pudding. It is no secret that the IRGC is actively engaged in the Syrian civil war, yet the coverage of that war shows no evidence of active use of Iranian UAVs. Case in point, the IRGC commander Esmail Heydari was filmed by a documentary film crew walking into a rebel ambush in August of 2013 (2). I'm sure he would have appreciated having a UAV handy to scout ahead; a basic Iranian made UAV, with German spare parts, would have been sufficient to the job. Just like the Iranian made SAMs are no where to be found as the Israeli air force strikes Syrian targets at will. Jabbar, this example is likely a prototype. Perhaps you'd be better employed providing perspectives on Iran's healthcare services but I hesitate in suggesting it: all we'd ever expect is negative, nonobjective coverage. JF -you are too good in entertaining people aren't you!? @-Unknown to the world this 'big' UAV is not knew, and is not even the only biggest!.YOU have to look closely the Hizzbollah Ayyub drone that entered Israel and scared the hell out of the 'regional' superpower ,and you notice that in fact that drone is bigger than this one!,here comes into mind how 'cheating ,hiding information,confusing your enemy ' being a game played by all in the military world! is at practice in the IRAN. @-Talking of German spare parts ,i think you are fixed to your discoveries !.the day you stumbled on the German Uav engine theft story must have been a big day to you!.But if Germany allows its UAV engines to reach Iran ,then the US must hold HER responsible for breaching the sanctions .And again your story would be more appealing HAD YOU accused the designers of this drone for coping the US predator. @-But it is promising to see that at last FOR THE FIRST TIME you agree and acknowledge some technological achievement in IRAN and only lamenting the poor workmanship and carelessness -only sad FOR your silence on the cameras,and the general performance of this robot ,it would be great if you commented on in that area rather than focusing on small bolts and miniature holes!. BUT as usual you are only careful and excellently focused when dealing with the hanging practices!.I wished you forgot the two bolts and dealt with this!. Two SCREWS??? Just TWO SCREWS???? This author had to chance to present a comprehensive analysis of the drone and all he could come up with is issue about TWO SCREWS???? Yeah, because of two screws, the drone won't fly!!! Is this a comedy center or something???? The old Soviet Union used to parade wooden missiles mounted on their trucks to project the illusion of numbers. And recently the regime used welded barrels mounted on trucks and claimed those as S300 missiles. But at end of the day it's the economy that will make or break a regime. In the 90s, the USA started using massively the PATRIOT system dubbed as the "top of the line" defence against missile systems... And for what result!!! Almost none shot down any UAV, incoming missle (even old Scuds) or Plane... Yet the U.S.A (United States of Ashamed) push for selling these not even third rate systems to foreign country... Well... Who in the U.S are mcking their defence ministry???? Oh God...It's General Doctor Admiral Field Marshal Fazeli.MD again...Let me let you in on a little secret Doc. 90% of the showpieces in any country are either mock-ups or early stage prototypes. There is plenty of video of this model actually flying...And German parts? What does that even mean? How about Iranian "parts" for Israeli drones while you're at it. We live in an ever globalized world, right? That was in the "90s". Now those missiles will turn all flying junk into scrap metal. Jabbar Fazeli, if you go to Iran military forum.net and click onto UAV section "FOTROS" PAGE 7 then 5th &16 column under the names of "kaman" & "WUDANGMASTER" they are bursting their balls saying all things bad about you and Uskowi site. These are prototypes, although functional but still under development. Engineers open/close/ and thinker with them through testing phases. A-400 is a good example of a prototype being put together sometimes with even a duct tape! that does not mean it's a bad aerospace product, just a prototype! Thanks, I think I'll take that as a complement. It's always amusing to see who comes to the defense of this regime whenever they're exposed in a lie. Prototypes are not supposed to be missing screws and have obvious structural problems. It looks like the regime apologists will stop at nothing to defend their patrons in Tehran. how about a comparison of the two side by side,guess the s300 must be made out of oil drums too? Of course, those who see the regime in purely black and white terms (black, in this case) will ridicule anything and everything the regime does - even showcasing a UCAV prototype that is a clear technological leap for Iran. It goes to show that ideology has no place in unbiased journalism. how "functional" could it be if it's so shoddy that it would rip open if anyone sent it aloft? What a racist and stupid comment. hey mark when do you think we'll see photos of the new iranian submarine? and do you think this new drone has retractable wheels to make it more stealthy? Iran has four S-300 SAMs of an older model, but they were never put into service. They aquired them solely for the purpose of reverse engineering. They obtained them secretly at the time, from Belarus and Russia. They also obtained missiles for the launchers from Croatia. Yeah,but don't forget the USSR was the one that taught the Egyptians that trick.After the break up of USSR they revealed this information. The S300 systems which were paraded in Tehran were fakes.
" Iran has four S-300 SAMs of an older model "
It's an anti-Iran, propaganda centre. More functional than a lot of those commenting here, if all they can say about it is two screws. Something easily corrected. No my friend the "anti-Iran propaganda centre" is the ministry of "information and culture" in Tehran. What do you think about the CNAS and some authors' participation of this blog, in that CNAS? ?